An amateur photographer in Portsmouth, New Hampshire, drew crowds when he used a drone minihelicopter made by China’s DJI Technology Co. to capture images of historic church steeples and other sights. 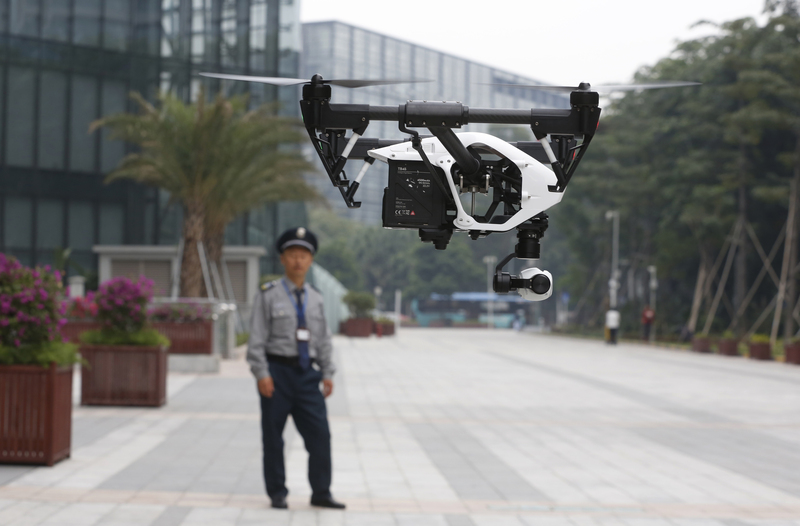 Founded in 2009 by an engineer with a childhood love of radio-controlled model planes, DJI has become the world’s biggest supplier of civilian drones — possibly the first Chinese company to achieve that status in any consumer industry. It has grown from 20 employees to a workforce of 2,800, including Chinese, Americans and Koreans, at its headquarters in the southern Chinese city of Shenzen and at outposts in Los Angeles, Tokyo and Frankfurt, Germany. “It’s really amazing what they have managed to do,” said industry analyst Maryanna Saenko of Lux Research Inc. in Boston. DJI’s latest model, the Inspire 1, released in November, carries a camera that can send live video to a smartphone, with a GPS system to compensate for wind and hold it still in midair. The company is part of an emerging wave of Chinese startups in fields such as robotics, clean energy and telecommunications. The Communist Party hopes they transform China from the world’s low-wage factory into a creator of profitable technology. 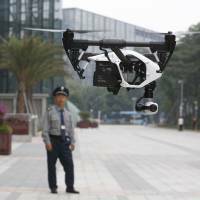 DJI and its rivals, including France’s Parrot SA and 3D Robotics Inc. of the United States, foresee demand for drones to shoot movies and news footage, survey farmland or oil fields, inspect power lines and oil pipelines and give firefighters a bird’s-eye view of burning buildings. Privately owned DJI, on the outskirts of Hong Kong, declined to disclose sales or profit figures. But founder Frank Wang told the South China Morning Post in Hong Kong that revenue in 2013 was $131 million. The company says revenue grows by 300 to 500 percent a year. For professional use, DJI launched its Spreading Wings series of bigger copters with up to eight rotors last year. They offer advanced steering and image-stabilizing systems and sell for up to $10,000. Richardson, a former news photographer, said he got on DJI’s waiting list for the latest Phantom model as soon as he read about it. In February 2012, DJI released its first full-fledged drone, the spindly Flame Wheel. Later that year, it added a camera to the first Phantom after seeing customers mount GoPro Inc.’s wearable video cameras on their drones. Since then, research has spread to include cameras, software for imaging and control and stabilization systems. Expanding beyond drones, the company has used its know-how in stabilizing images to create the Ronin, a handheld camera mount. Priced at $3,000, it is marketed as a lower-cost alternative to steady cam systems used by film and TV studios. The company has opened its software development process to outsiders to create additional tools. A Swiss software maker, Pix4D, has designed an application to transform images shot by DJI or other drones into 3-D maps. Huawei says its next smartphone model will have an app to control a DJI drone and receive live video. In October, the company briefly entered American pop culture when characters on the “South Park” cartoon used a video-equipped drone modeled on DJI’s Phantom to spy paparazzi-style on their neighbors. DJI rolls out new models as little as five months apart, a rapid pace that reflects intense competition with smaller brands promising lower prices and more features. Unusually for a startup, DJI handles almost every step of its process itself, from research and production through worldwide sales and repairs. That has led to complaints as repair centers struggle to keep pace with sales.